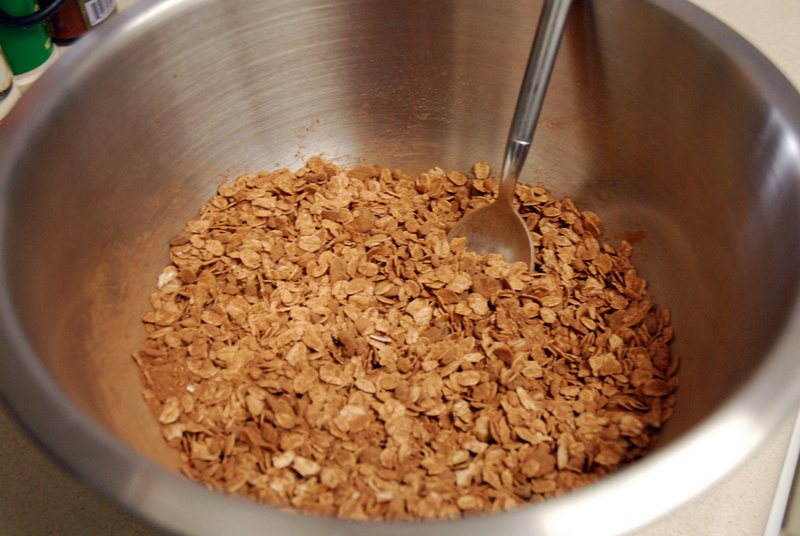 Did you know that granola was originally called “granula”? Its original form was crumbled graham flour and the inventor was Dr. James Caleb Jackson. It was Dr. John Harvey Kellogg who changed the “u” to an “o” and called his mixture of wheat flour, cornmeal and oatmeal “granola”. This was back in 1889 before Kellogg began investing in the cereal flake, which led to all the sugary cereals in grocery stores today. It wasn’t until the 1960’s that granola reemerged as a healthier alternative to cereal, and the first mass marketed granola was introduced in 1972 by Heartland Natural Cereal. 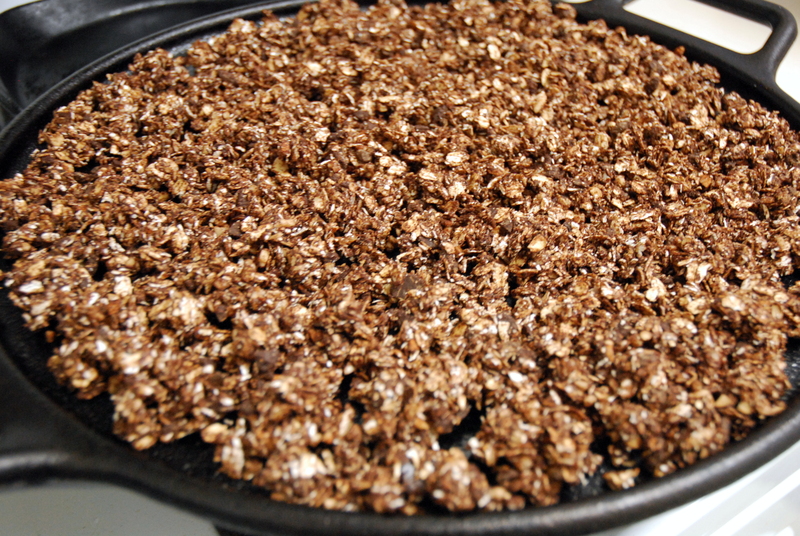 I learned all this from an article this morning and thought all my fellow granola lovers might find it interesting! I’m glad granola had a revival! And that I started making it on my own – it’s just so easy! 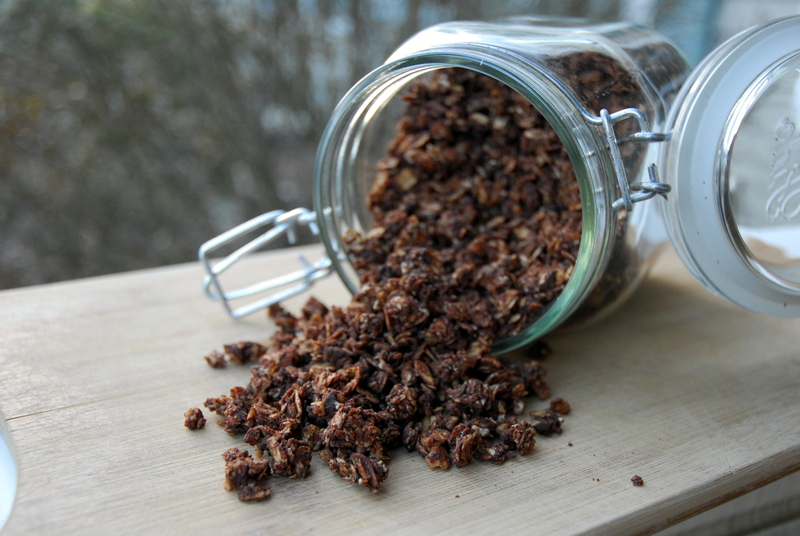 My latest granola creation is Chocolate Lover’s Granola. 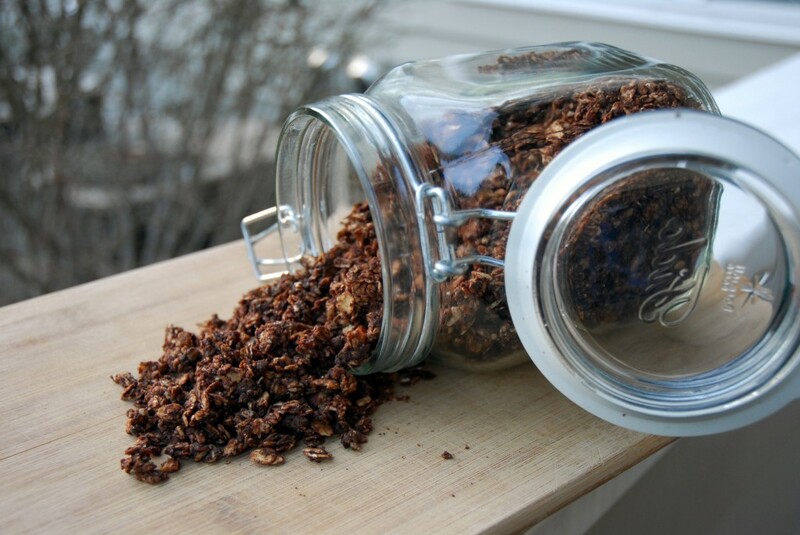 Before I started making my own granola, I frequently bought Bear Naked’s Heavenly Chocolate Granola. So I set out to make my own version! 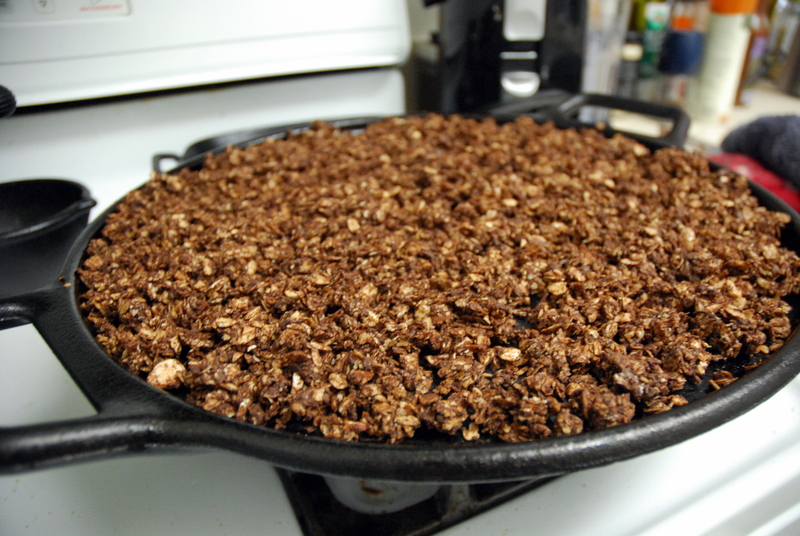 Like all granola, it only requires a few simple steps. 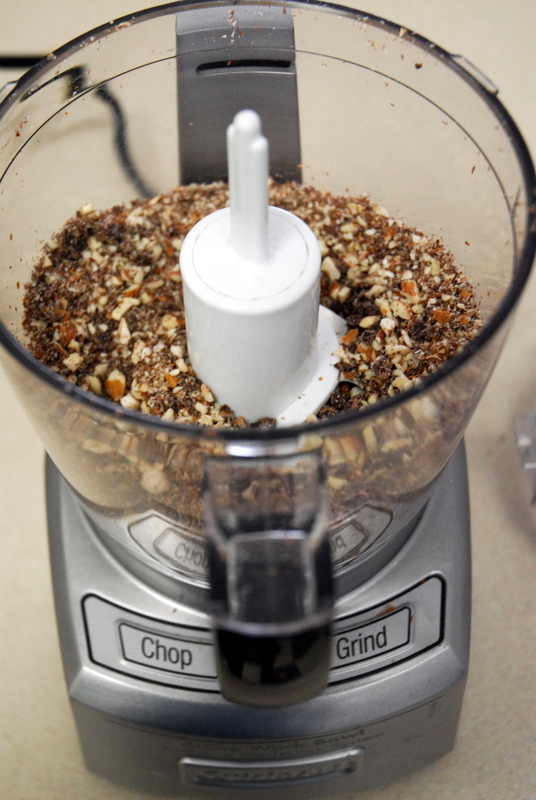 First, chop up the almonds and chocolate chips in a food processor. Then mix your oats, almonds and chocolate in a large bowl. Mix in your cocoa powder. Add the honey and canola oil and mix together (I get messy and use my hands for this part). Put the mixture on an oiled baking sheet and bake for 25 minutes at 325, flipping halfway through. Remove from oven and let cool for at least 30 minutes. Chop your almonds and chocolate chips in a food processor. 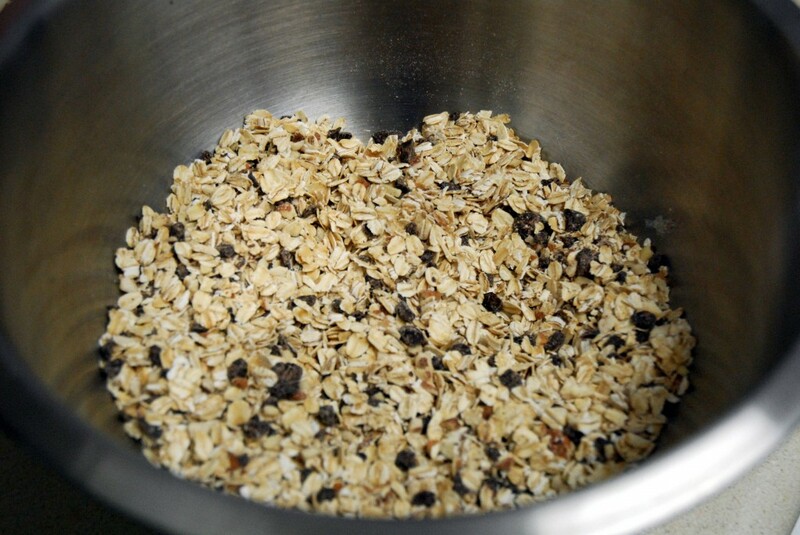 Add the oats, chopped almonds and chocolate chips to a large bowl and stir to combine. 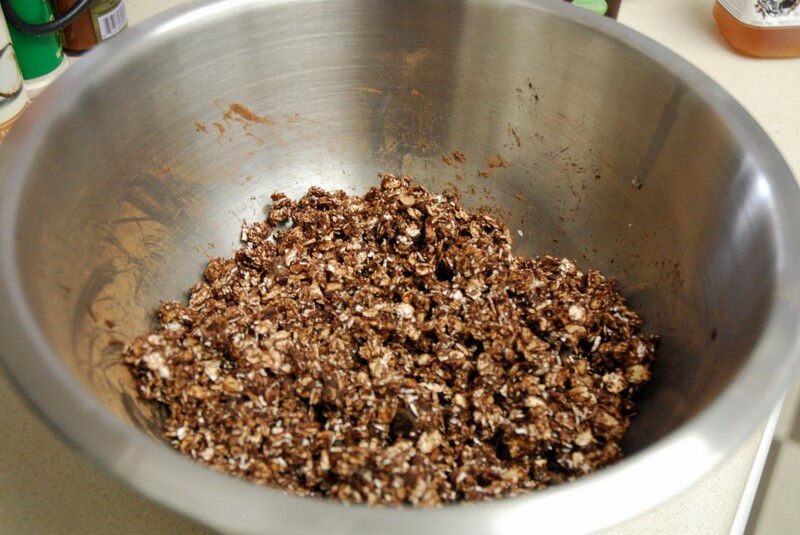 Add the cocoa powder and stir to combine. Add the honey and canola oil and stir to combine. You may want to use your hands to get the mixture combined well. Put the mixture on an oiled baking sheet and bake at 325 for 25 minutes, flipping halfway through. Remove from oven and let cool for at least 30 minutes (it will harden in this time). 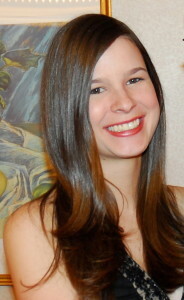 This entry was posted in Breakfast, Food for Thought, Gluten-free, Recipes, Snacks, Vegetarian and tagged almonds, breakfast, chocolate, gluten-free, granola, oats. Bookmark the permalink. This granola looks fabulous!! Love the addition of chocolate chips! That’s interesting they used to call it granula. Funny how names get changed. I love how simple this is. It demystifies the granola-making process. Looks great! Made this mulitiple times now, always good and much cheaper then in the store. Thank you!